Want Kitchen Quality Cooking in your Truck? 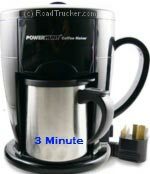 3-Minute Coffee? 7 Minute Grilled Steak? 4 Minute Hot Sandwich? Power Hunt! Better, Hotter and Faster cooking then any other 12 Volt Appliance on the market today. Your 12 Volt Lighter plug just doesn't have the power requirements needed to allow the 12 Volt appliances to do an outstanding job, so manufacturer's design their 12 Volt appliances to use as little power as possible. The results are 50 minute lukewarm coffee, marginal heating and mediocre dinners that can take over an hour to cook. So what is a hungry Trucker to do? Well like it or not, there are only 2 viable solutions. You can use an inverter with your 120 volt AC appliances. This will work for you, but it is very inefficient and you will pay for that inefficiency in less Miles Per Gallon of fuel. There really is no free lunch. The best answer is two-fold. 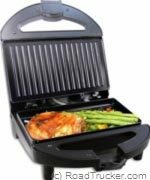 You need to go directly to the battery and you need 12 Volt Appliances that were designed to draw enough power to do an excellent job of cooking. Power Hunt has done both with their line of 12 Volt High Performance Appliance products. Save Money: Brew Your Own Coffee! Heats Water for Tea, Noodles, etc. A Full Breakfast in About 8 Minutes! NOTE: When you add your Power Hunt Appliance to the cart, we will also add a 12 Volt Power Port that hooks to the battery via 8' of wire with 2 connecting rings on the end. If you already have one, then click on "remove" in the cart to remove it before completing your purchase. First time Purchase of a Power Hunt Appliance will need the Power Port. Power Hunt brings you an all-purpose contact grill which plugs into Power Hunt's Power Port and Grill pork, steak, chicken, hotdogs, and burgers in minutes. With the high-quality double non-stick coating, you can clean the unit easily after use. Ideal for long hours on the road, camping, and boating. Cook sandwiches in minutes with the Power Hunt High Performance 12 Volt Sandwich Maker. Great use for camping and road trips. Enjoy your favorite toasted hot panini sandwiches in about three minutes. Plug this handy sandwich maker into your Power Port and stuff yourself full inside your vehicle while traveling. Your Favorite Sandwich in 3 Min! The Power Hunt 12-volt Power Port is the powerhouse of 12 volt Appliances from Power Hunt. Connect directly to battery and access its full electrical potential to allow your PNP appliances to operate at best performance. First timer? Buy this power port along with a Power Hunt Appliance. 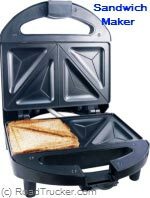 (microwave, heater, coffee maker, sandwich and contact grill.). NOTE: Power Hunt has discontinued their cooking appliances. Only the Hellfire heater is still available. Patented PNP outlet design provides plug and play usability.